Meet Amazon Alexa: the personal music curator you control with your voice | What Hi-Fi? And then, as simple as that, you’re listening to Kashmir by Led Zeppelin. 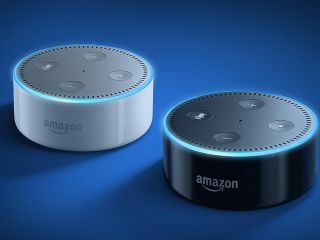 Alexa, the super-intelligent assistant (‘smart’ just doesn’t do her justice) in the Amazon Echo Dot, connects to your Amazon Music library, Prime Music or Amazon Music Unlimited accounts, and even Spotify. And she can access your music for you from a simple voice command. Plug the Amazon Echo Dot into your existing hi-fi system or active speakers using its 3.5mm output (or connect it via Bluetooth), and Alexa can act as your personal music curator. Alexa can help with more than just finding stuff to listen to, though. Her voice-commands extend to your smart home (compatible lights, switches, thermostats and the like), and she can even help you run your life by connecting to your calendar, weather services, travel information, news outlets and more. You can order food from Just Eat. Request rides from Uber. Set alarms and reminders. And new skills for Alexa are being added all the time; you can easily connect up new devices and services through the free Amazon Alexa app for Fire OS, Android, iOS and desktop browsers. Alexa can hear you over noise and background music thanks to seven microphones that use beam-forming technology and enhanced noise-cancellation. You can place Amazon Echo Dot in more than one room, too, and connect them up to your various speakers and sound-systems for a whole-house assistant. Tired of prodding your smartphone or scrolling around on a trackpad looking for music? Want to find something new? You only have to ask.